Finally, after six stops in "Colorful Colorado", we were ready to leave the big- mountain state for slightly different terrain at Canyons Bike Park in Park City, Utah. Canyons was one of our favorite parks that we visited last year. The runs are short, but jam packed with well-built features. We were chomping at the bit to ride their new (double black diamond) trail called Split Decision. Last summer, we caught only a glimpse of what was in store for riders on the new trail, as it was still a work in progress. What we saw made us super excited and a little scared. Big gap jumps and drops rule this trail. A good warm-up on some of the other trails is recommended before sending it on Split Decision. However, once you've warmed-up, scoped the trail, and linked all the features successfully, the endorphin rush will have you floating high above the aspen trees for days. Of course, no stop would be complete without something going wrong. Natty awoke the first morning, bright eyed and bushytailed. She got dressed and ready before anyone else, only to realize that her bike shoes where in fact, still in Aspen/Snowmass. Thus began her morning of shop hopping, looking for not only clipless mountain bike shoes, but also Time ATAC cleats. Surprisingly, No shop in the village had clipless shoes. She even got a lecture from a shop store worker about the dangers of riding clipless at a bike park. WTF?!? She bit her tongue, while she thought of all the amazing bike park riders who are clipped in…Smith, Atherton, Minaar, Peaty, etc… Fortunately, Natty was able to catch a ride into Park City where she was able to buy new shoes and cleats. Disaster averted, again! 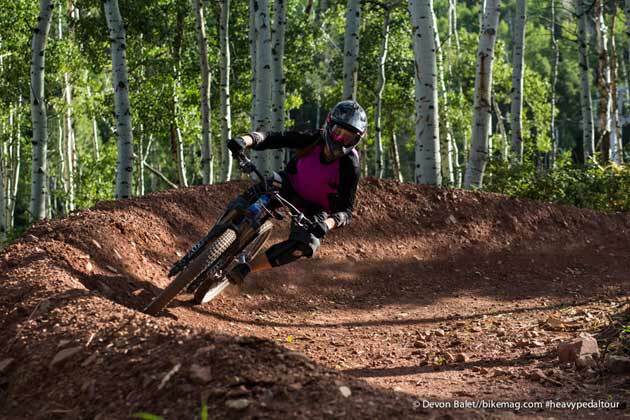 Canyons bike park is right next to Park City with all of its awesome restaurants/bars, nightlife, and conveniences. 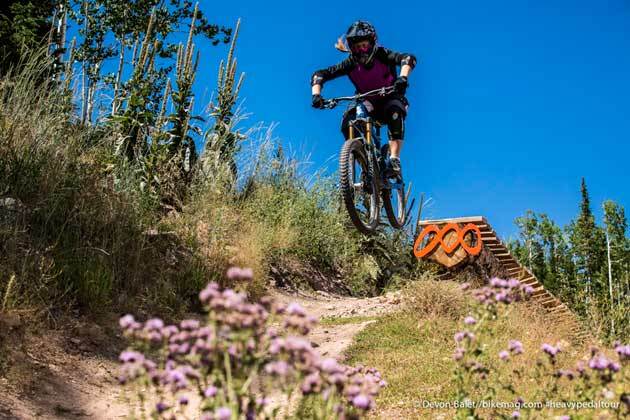 Park City has earned an IMBA gold-level ride center designation for the abundance and variety of bike riding opportunities. Canyons recently hosted the Bell Enduro Cup race with a gnarly DH- style trail called Insurgent. The trail crew have been working hard on Insurgent, adding new feature options on the steep terrain that flows down from the mid-mountain lift. It makes for a great way back down to the Canyons village area. Salt Lake City is a mere 35-minute drive from Canyons. So, there's easy airport access for visitors and tons of natural beauty in the surrounding Wasatch mountain range. We did get a chance to sample some good eats at the Farm restaurant (voted best new restaurant in Utah for 2012) in Canyons village. The village vibe is chill. Weekends are much busier with a huge draw of people driving up from SLC. You'll see riders at Canyons with all-mountain bikes, freeride, and full-on DH bikes. We think a freeride or DH bike would work best for most of the trails. Very skilled riders could get away with an all-mountain style bike at Canyons. The weather is generally perfect in the summer. Occasional thunderstorms are normal in the high mountains. If you can, take advantage of the resulting tacky conditions following a rain event. The traction is awesome. Otherwise, dry dusty trails are the norm. 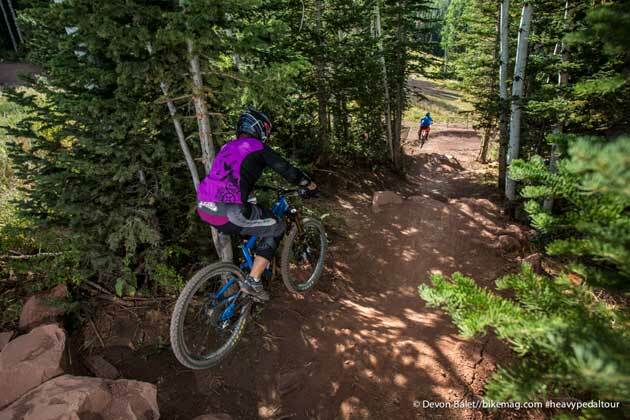 Consider yourself warned: the trails at Canyons aren't long, but they are jam-packed with features for all skill levels. If we had to describe the trails with one phrase, it would be "freeride/flow". Canyons is not afraid to challenge riders with sizeable gap jumps, drops, step ups, step downs and wall rides. If they lack anything, it's steep-gnarly DH style runs. Vail Resorts has now taken over the operations at Canyons. 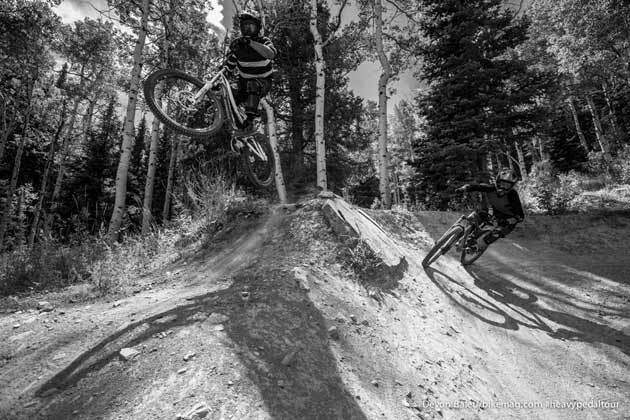 Hopefully, with Vail's deep pockets, the bike park will continue to expand its offerings to the ever growing mountain bike community. Currently, lift tickets for the day run $29. Parking is free, and they have a full-service bike shop (flat pedals only). Word to the wise, come prepared with your own private stock of Alaskan Brewing Co. (freeride APA). Remember, this is Utah. The land of "3.2" beer.